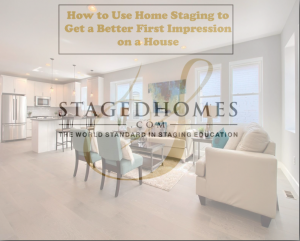 We’ve all heard the phrase, “you only get one chance at a first impression”; a good impression at least and that’s even more important when it comes to staging a home! It’s said that it takes no more than seven seconds for someone to form a first impression and decide (based on looks) if they are or are not interested; the same goes for potential home buyers as well. That’s where staging a home comes into play! Staging not only gives sellers the opportunity to form a better first impression on potential buyers, but also increases the chances for the house to be bought at a higher price. Focus selling the house rather than the decor. When it comes to getting the “love at first sight” first impression buyers have to fall in love with what makes the house special rather than loving the decor more. Making sure to emphasize the architectural details of the home will help add more to the first impression. Address the FIRST and FOREMOST areas of the home. Before deciding which rooms are going to be staged, the most important thing is to access which rooms of the home are deemed “first impression” areas. It’s typical that the entry will be the first area staged in order to increase the maximum wow factor when the buyer first walks in to the house. After that, tackle whatever rooms that will add to a lasting impression. Don’t be afraid to be resourceful with your accessorizing. For those who may not have the budget for a full staging or are just looking to add touches to your own home, it doesn’t take much to freshen up an old look. Being resourceful and thinking outside the box are two key competent when you’re working with either a limited budget, limited supply of decor, or both! Adding a new coat of paint, switching out pieces of furniture, bringing in some greenery (real or fake), or even just rearranging the room; all of these ideas are quick and easy ways to add a little more to that first impression. The final step: Make sure to have a professional photographer! The first thing potential buyers do, even before they actually see your house, is look at the online photos of the house. This is where the true first impression occurs so more than anything it’s crucial to use a professional photographer; no matter how good the photos look that your smartphone takes. When it comes to ensuring that you’re showing potential sellers what the house truly looks like, (no weird shadows, off colors, glares, blurring, etc.) use professional photographers! They have the needed cameras, lenses, plus all the right equipment to get the perfect lighting and angles to show the house at the very best. 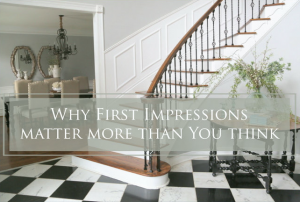 Want to see the results of keeping how important first impressions are in staging? 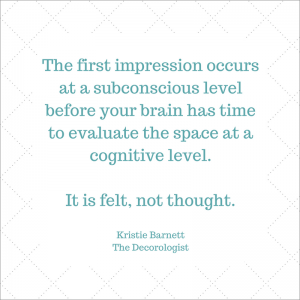 Check out the following article from the Decorologist! Though there’s nothing like making a great first impression, staging brings an even greater opportunity to give strong, lasting impressions on potential buyers. Now that’s something to learn, thank you for a very clear explanation and a very informative article, gives us a clear starting point.